“It’s Free Swipe Yo EBT” Fake? Chris Jackson on “It’s Free Swipe Yo EBT” Fake? Cargo on “It’s Free Swipe Yo EBT” Fake? Fubar on “It’s Free Swipe Yo EBT” Fake? 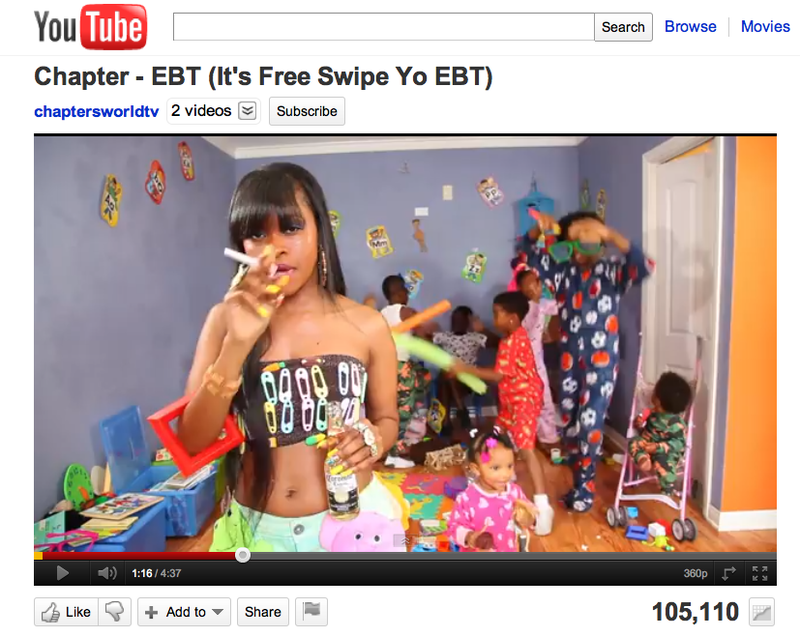 Feeding frenzy: Who’s behind the unsavory food stamp parodies | Greediocracy on “It’s Free Swipe Yo EBT” Fake? Is this for real? Well, here are some facts. You decide. Let’s start with the info posted with the YouTube video. 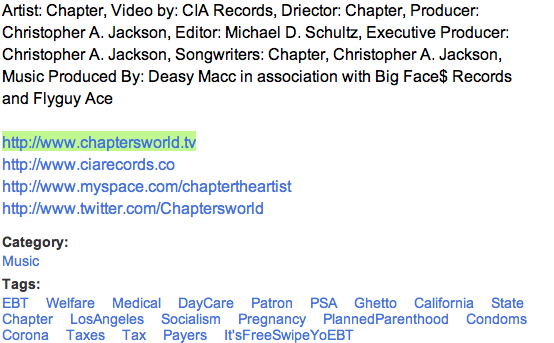 The website listed is chaptersworld.tv and the executive producer is listed as Christopher A. Jackson. Interesting search tags. Anyway, let’s check out chaptersworld.tv. There are many curious things about this website, but a quick search of the address on the contact page reveals that it’s a Mailboxes & Things. 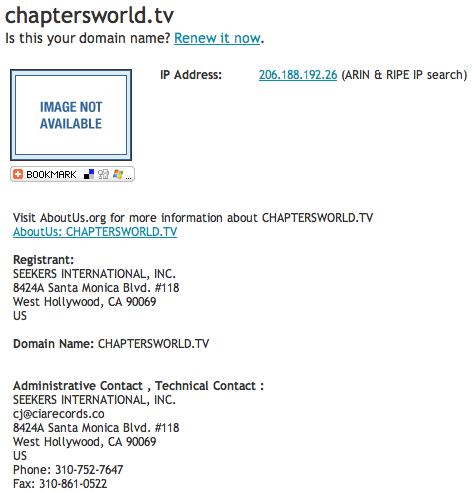 Here is the whois data for the “rapper’s” website chaptersworld.tv. 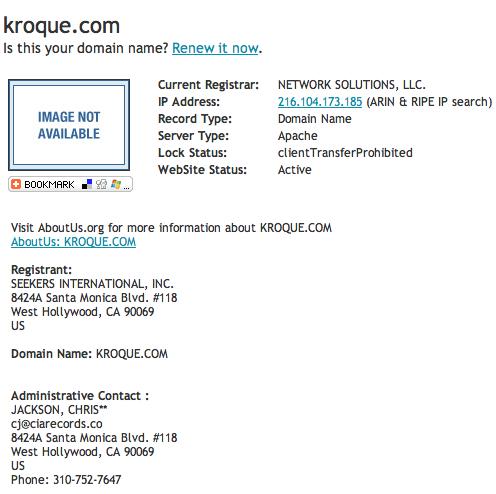 CIA Records’ site has a similar whois with cj@ciarecords.co as the contact. “CJ” is most likely the Christopher A. Jackson listed proudly several times in the video info on YouTube and the in the video credits. Mr. Jackson is also the administrative contact for another website – along with Seekers International, INC as the registrant company. 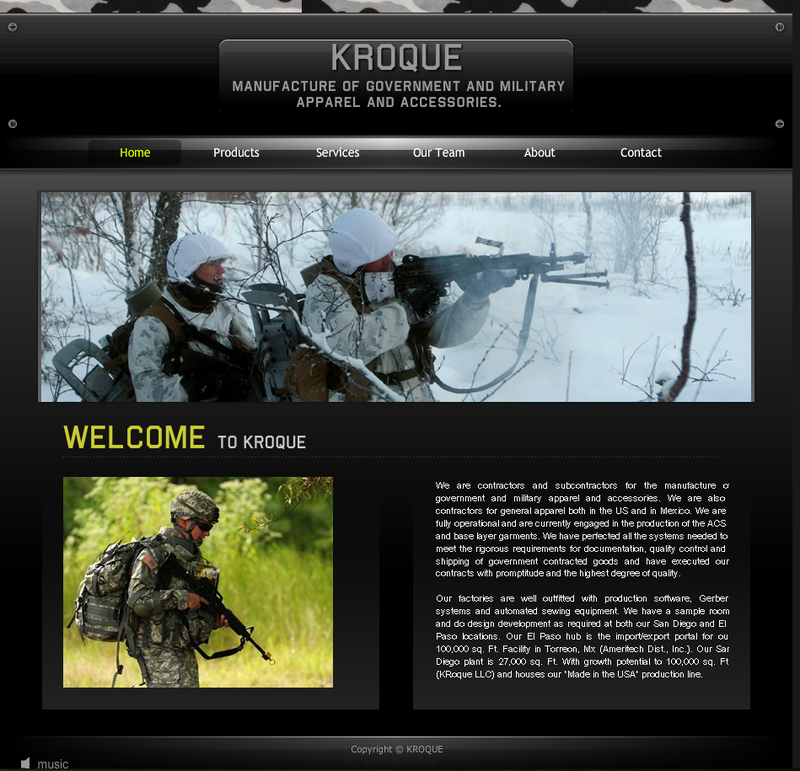 Kroque.com appears to be a military contractor of apparel based in California. And if you click on the team page, you will see Chris Jackson listed as the EVP and Chief Business Development Officer, with the same business address as CIA Records. The main question: why did a top executive of a military contractor write, produce, and fund “It’s Free Swipe Yo EBT” ? Maybe he loves rap. There are plenty of other questions left to explore regarding this video. Happy Hunting Internet. Nice net sleuthing. Maybe CIA Records is really run by the CIA! Maybe Chapter is his girlfriend? Lucky dude! I suspect that KROQUE’s female COO is purposefully the COO in order to qualify for federal contracts via “female owned” contracting company status for federal set asides. Wouldn’t it be ironic if Karen Roque was also a minority, thereby qualifying as a minority owned contracting firm as well. Doubling down at the federal trough, while the company’s executive officer funds the production on this stenchy video. Perhaps someone in Cali can track that down. Haha!! You are very sad for this blog. Everyone wants to believe in some type of conspiracy. There is not conspiracy, just people working hard and following there dreams. It is too bad people have to make this kind of truth about race. Well, that is an easy thing to hide behind, that should change the world for the better. Lol!! From the info I found here I did some digging on my own and came up with the following. Latoya “Chapter” Hicks’ latest video “GFE” about craigslist prostitution has two new associate producers, David and Jennifer (Guerin) Houck. David Irvin Houck is a high end building contractor in Southern California. Whether “Chapter” or the Houcks are sincere in their endeavors to “help”, it is quite obvious to me that the way they are going about it is wrong. As a white person it makes me uncomfortable to see this. It is like watching blackface performance. There are much better ways to motivate proper behavior than this. Rich white people backing the denegration of poor black people is understandably upsetting to the community. If you pulled yourself out of the ghetto and overcame sexual abuse then make something positive not showing the negative aspects of ghetto life in satire. As can be seen from multiple posts on youtube people don’t get it. A lot of people think she is being serious.